When I choose to support a cause, I try to understand it as much as possible. That is why, when I read about the Summer Food Challenge which benefits America’s Second Harvest of the Big Bend on Facebook, I immediately knew I had to do the “go without food for an entire day” option in addition to the “donate” option. Who am I kidding? My life doesn’t work that way! I was kidding myself to think I could find a low-key, “calm” day! In addition, my day without food was time-limited. I knew I could pick right back up on my nutrition the next day (or, technically, at midnight). It was a novelty. For one out of every five Leon County residents (56,000 of our neighbors, 11,000 of whom are children), who are food insecure, hunger is no novelty. Nor is an abstract term like “food insecure” while accurate, a novelty. It is an imperfect term describing what they really are: hungry. Summer months are especially difficult, since children do not have access to breakfast or lunch programs at school. When I ran four miles with nothing to eat before and no plan to have anything to eat afterwards. Imagine you are a kid, showing up for school, and it’s time for p.e. or free play. Imagine not having the energy to run, climb, be active. When I took my son through a drive through and smelled the tantalizing aromas of his food, knowing I could not partake. Imagine you are a kid, seeing your peers filling their tummies, sometimes with “treats” like fries but other times with fresh produce, protein-filled foods, and plenty of hydration. When I had to deal with the (usually) minor stresses of getting my elderly father-in-law up, fed, dressed, and driven to his physician’s office for an appointment, communicating clearly and calmly while complying with other people’s deadlines. Imagine you are a kid, navigating through a society with all kinds of people, some nice, some mean, some who want something from you, some who want to be left alone. Imagine needing a clear head to read cues and a stable blood sugar level to cope with the world around you. Speaking of needing a “clear head,” when I decided to prepare and deliver a Toastmasters speech on the topic of the Summer Food Challenge that night … when I had to compose and deliver a ten-minute speech to a table full of people munching on chips, salsa, and Mexican food, convincing them to spend money (or time) on food for others instead of tacos for themselves. Imagine you are a kid, expected to organize yourself and your schoolwork, to submit projects on time, to participate in class energetically, to stave off distraction in order to concentrate on your education. I came away from my day without food empathizing more fully with the children (and adults) in our community who don’t know where their next meal is going to come from. I came away from my day without food imagining a community where children can play, learn, and live free of food insecurity, free of HUNGER. If you want to feel what the food insecure members of our community experience, join me, Tallahassee Democrat Publisher Skip Foster, Tallahassee Police Department Chief Michael DeLeo, and State Representative Alan Williams in accepting the challenge of going a day without food (without endangering your own health, of course). Pop in on the Summer Food Challenge Facebook page and let us know how it went. Download a flier and post it at your work, church, or civic organization. 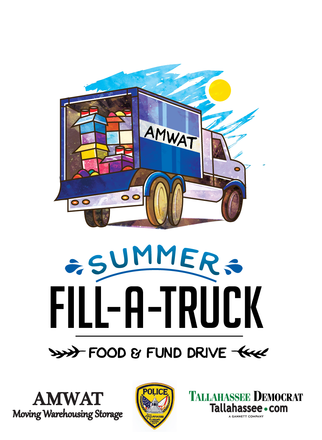 Drop off food, cash, or checks made out to ASHBB (note “Fill a Truck”) to the Tallahassee Democrat at 277 N Magnolia Dr between 8 a.m. and 5 p.m. Monday – Thursday of this week (6/15/15-6/18/15). Donate online via this link. 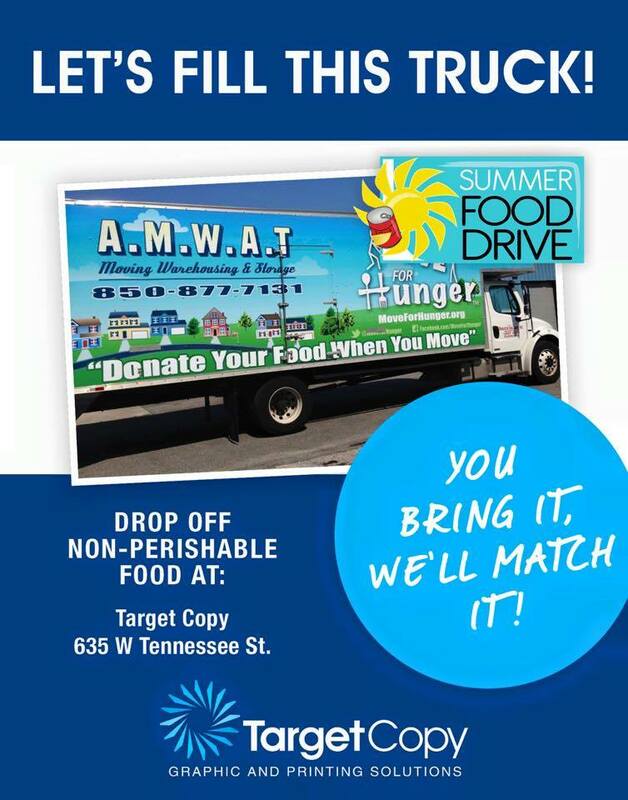 Drop food off to Target Copy at 635 W. Tennessee Street, and they will match your donation! If you drop off to the Democrat on Thursday, 6/18, between noon and 7 p.m., you can participate in the community weigh-in at the on-site scale. (Let’s hope to exceed last year’s three ton mark!). These are the most useful items: peanut butter, jelly, canned beans, canned tuna/chicken, rice, canned vegetables, pasta sauce, macaroni and cheese, soups, fruit juice, cookies, crackers, baby food/formula, condiments, and salad dressing. One action you can take that helps people with food insecurity year-round is to run, walk, or cycle using the Charity Miles app and select Feeding America as your designated charity. For every mile you run or walk, Charity Miles will “sponsor” you, meaning they will donate a quarter for every mile run or walked, and a dime for every mile cycled. It’s that easy! 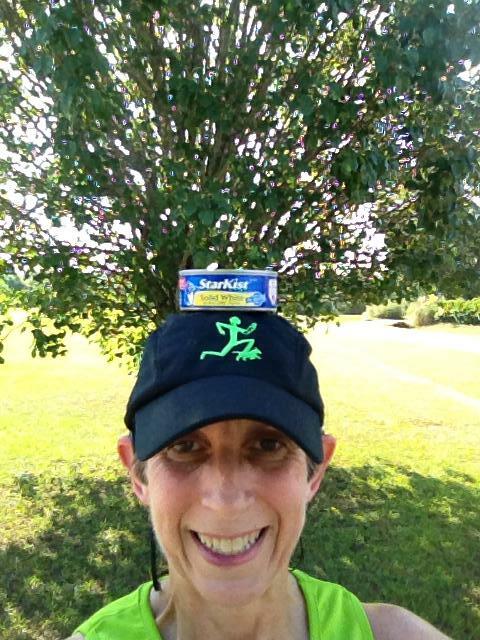 For my four miles on Monday, I earned $1 for Feeding America, for something I would have been doing anyway (and, yeah, I posed after my run with a can of tuna on my head for added effect!). FINALLY ……LET’S FILL THAT TRUCK!!! !